I have to apologize again for the lack of reviews lately. My responsibilities get the best of me sometimes and I forget to work on what I really want to be working on: this blog. This week’s Netflix review is another horror film: The Awakening. 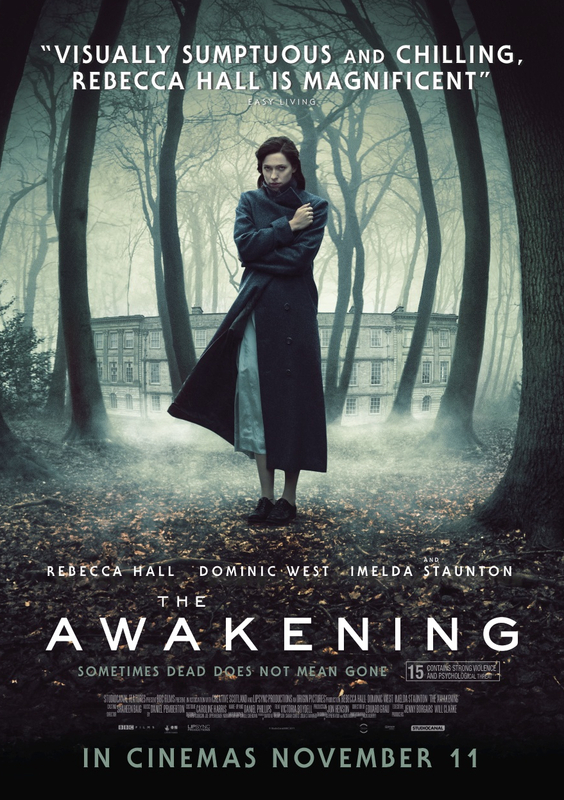 The Awakening is set during the recent aftermath of WWI in England and stars Rebecca Hall as Florence Cathcart, a paranormal skeptic who routinely discredits charlatans. Robert Mallory, a boarding school worker, approaches Florence to request her help in identifying a ghost that’s terrorizing the school. The experience, in a rather unimpressive manner, makes Florence a believer in the paranormal. Unfortunately, The Awakening is nothing more than a beautifully shot film with a subpar storyline. There is nothing inherently scary and the jump scares are entirely too predictable. The Awakening comes fully equipped with claustrophobic shots marked by obscured framing that emphasizes the elusiveness and mystery surrounding Florence’s past. The Awakening is quick to remind us that not everything is what seems. Unfortunately, this framing technique is not especially revolutionary nor does it break any grounds in the horror genre itself. The claustrophobic shots are often juxtaposed next to long shots of the stunning English countryside, which seem to be devoid of any revelatory purpose. Shots are consistently framed in mirrors and windows to signify the distortion of events. I can’t deny that the cinematography was awesome; the film’s atmosphere is heightened with a greyish overcast. In truth, The Awakening gave me ample material to upload to my Tumblr. However, the stunning shots were useless against the backdrop of a scattered, sloppy, and ultimately unstimulating plot. As I said there’s nothing innovative in this film: creepy dolls, claustrophobic shots, jump scares that are easily predicted, cryptic children, and a heroine who lost a lover but finds new love. Despite the awesome cinematography, The Awakening is ultimately a forgettable piece of cinema. I wouldn’t seek this one out on Netflix, unless you’re desperate for a horror flick with some decent atmosphere (or you really love Bran Stark from Game of Thrones, the actor plays a boarding school boy here). Though, I can’t say that there’s actually much “horror” to be had with this one. The Awakening regrettably lacks the ability to actually awaken anything within its viewer, least of all terror. Question: Have any of you seen Slavoj Zizek: The Pervert’s Guide to Ideology? I’m hoping to see Willow Creek and The Sacrament this week will be writing reviews of them, but I was hoping to do another Netflix review soon. So, feel free to let me know if you have any recommendations. Hey! You’re my first request. 🙂 You got it. Look for it next week. Hey! The Hostel review is up. Sorry for the delay, was hoping to get it out before today.